--To me this smells like the earth when its starting to rain. I LOVE that scent and have always wished I could find something like it in a body product. This is going to be so awesome to use in the shower on a cool autumn night. Honey Tree perfume sample - Quite rich! Right from the bee hive - honey amplified by seductive essence of resinous vanilla, darkened by a passing waft of mild rare wood smoke. --I get a creamy dark vanilla, but when I asked Jas what he thought of it, well..you know what they say about honey scents. =/ So I will most likely be gifting this one elsewhere. Earth bar soap -Aged patchouli, three vanillas and the glorious exhale of jasmine blooms. 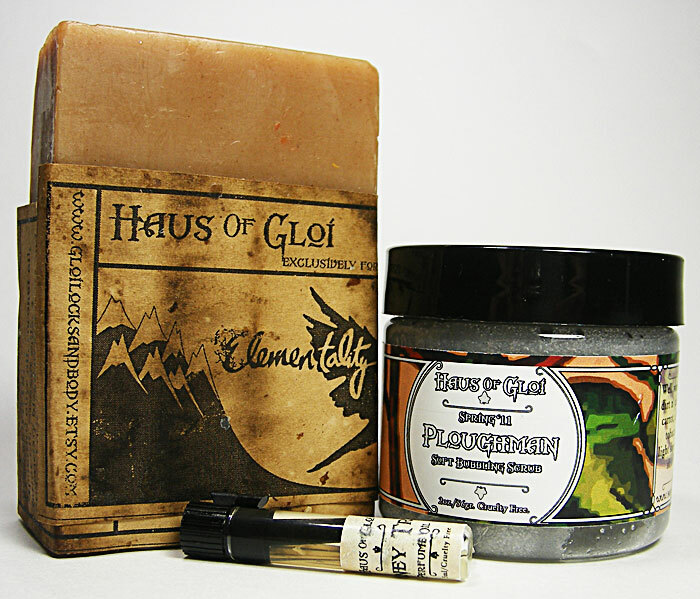 --This soap smells a little spicy and a little..hmm..perhaps musk but its light. I don't smell patchouli distinctly in it, which is great, cause I don't like patch! However; I think I'll love this when using it. Wow, that soap is some vintage HoG, very cool looking. Who was it "exclusively for"? Elementality I am guessing. :) I really have no idea, but the scent is Earth. It smells great, but I haven't used it yet. Too special!